Organic compounds were identified in the protostar system IRAS 16293-2422. The young binary system sits in the Rho Ophiuchi cloud in the red circle on the left edge of this image. Organic molecules once thought to be produced only by life-forms have been found in two separate regions of space: a nearby comet and the debris around a pair of forming stars. Previous studies on exoplanets have considered a substance, called chloromethane, to be a biomarker molecule, which means it indicates the potential existence of life. Before now, it was known to becreated by some tropical plants on Earth as well as industrial processes, where it is known as Freon-40. However, the new findings, detailed today (Oct. 2) in the journal Nature Astronomy, indicate that the chemical can also form without the help of life. At the time, Fayolle was a researcher at the Harvard-Smithsonian Center for Astrophysics (she is now at NASA's Jet Propulsion Laboratory). Fayolle's team identified the chloromethane on Comet 67P/Churyumov-Gerasimenko as well as around a pair of protostars in the early stages of forming a binary star system. The discovery was "a bit of an accident," Fayolle said. "I wasn't particularly looking for it." Fayolle was curious about the origin of chloromethane on Mars. NASA's Curiosity rover discovered the compound on the Red Planet, but there's been debate over its origins. Some scientists suggested that the compound could have formed when chlorine compounds, called perchlorates, on the surface reacted with carbon carried by the rover itself as it was analyzing samples. Scientists later confirmed that the carbon and hydrogen in Mars' chloromethane matches that found in meteorites. Therefore, impacts could be one source of the planet's chloromethane, but it could also have formed from smaller molecules on the planet's surface. Fayolle said the origin is far from settled. Fayolle's group first found chloromethane around the binary star system using data from the Atacama Large Millimeter/submillimeter Array (ALMA), in northern Chile. The telescope was surveying the binary stars to determine the system's chemical complexity. The Rosetta space probe detected traces of chloromethane around Comet 67P/Churyumov–Gerasimenko. The ALMA team was also collaborating with scientists on the European Space Agency's Rosetta mission, which led Fayolle to examine that data, too. Rosetta orbited comet 67P/Churyumov-—Gerasimenko for two years until it was steered into the comet in September 2016 at the end of its mission. Measurements sent back by the spacecraft allowed the team to identify chloromethane in the comet as well. Combined, the two discoveries shed light on the progression of chemistry in solar system formation. 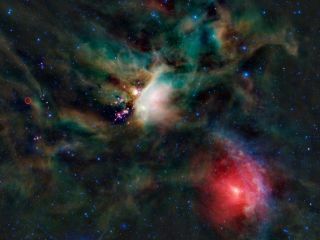 The results from the protostar system suggest that compounds like chloromethane can form efficiently as stars coalesce, according to a statement by Nature Astronomy. Meanwhile, the data from the comet indicate that these compounds can survive the formation of planets. This supports a continuous model of solar system formation, Fayolle said, rather than one where the heat of star formation causes chemicals to recombine, leaving few compounds unchanged and resetting the system's chemistry. "Based on our discovery, organohalogens are likely to be a constituent of the so-called 'primordial soup,' both on the young Earth and on nascent rocky exoplanets," co-author Karin Öberg said in a statement. This suggests that, in addition to forming in the presence of life, compounds like chloromethane may have contributed to its development.